This is a departure from the usual – think of it more as a “What I did on my holidays” post. During a recent Paris trip, Helen and I took the Metro out to the 16th arondissement, partly to look at some of Hector Guimard’s fabulously eccentric art nouveau apartment blocks; partly to stroll down the rue Mallet-Stevens, the gorgeous little Modernist cul de sac designed by Rob Mallet-Stevens in the 1920s (why isn’t Mallet-Stevens better known? 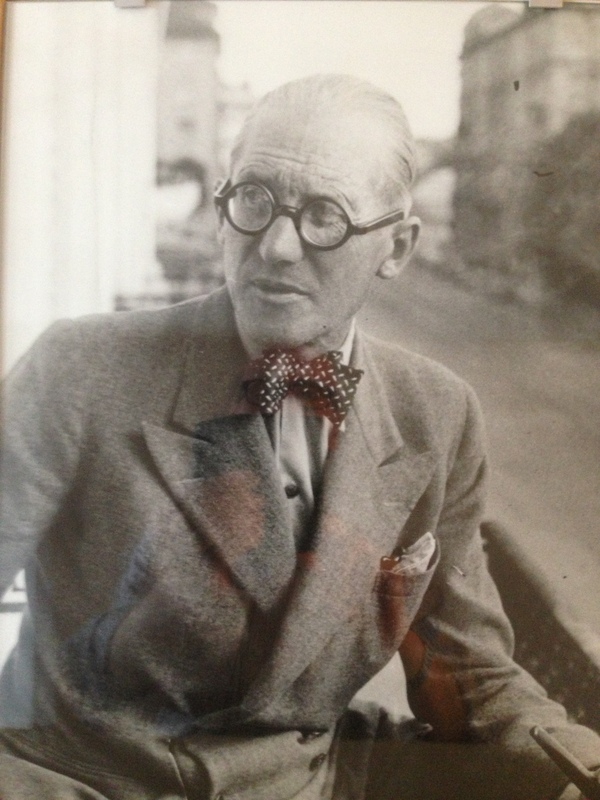 ); but mainly to visit the house just off the rue du Docteur Blanche that Le Corbusier and his cousin Pierre Jeanneret built in 1923-25 for their friend, the Swiss art collector Raoul La Roche. And we fell in love with it. Maison La Roche is Modernism at its best – simple without being austere, angular but never dull. A double-height hall, with lots of vertical stresses, gives way to the horizontals of the long, bright gallery shown here, its own straight lines relieved by a sweeping curved ramp which leads up to a mezzanine library. 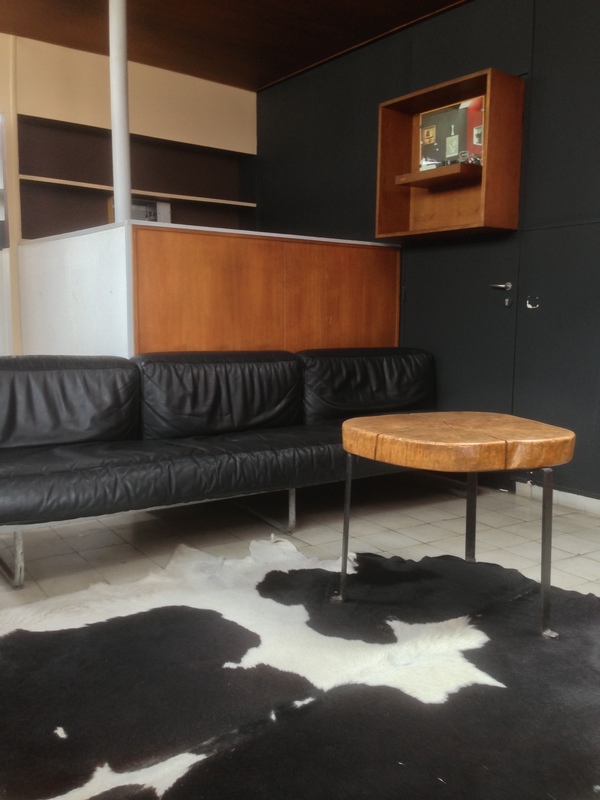 The furniture is all designed or chosen (some of it from Maples) by Le Corbusier. And the colours! 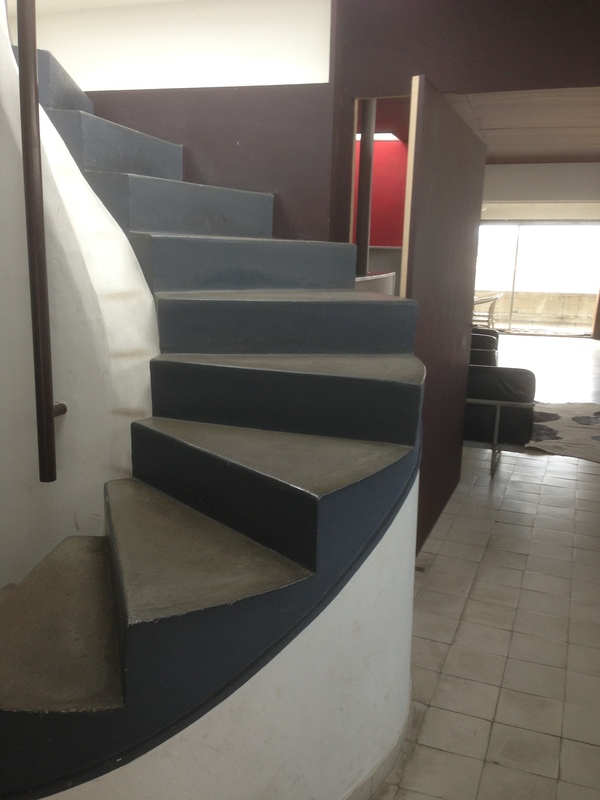 I had never understood just how important colour was to Le Corbusier. The interiors of Maison La Roche are full of greens and ivories and earthy reds, with walls of pale burnt sienna and woodwork of deep ultramarine. Shame on me for thinking he built white boxes. Living room at 24 N.C.
Maison La Roche spurred us to visit 24 rue Nungesser et Coli, the apartment building Corb designed in 1934, to see the 7th-floor studio-apartment where he lived and worked. Here again the polychromy came as a delight and a surprise, with great blocks of yellow and grey and red breaking up the interiors. Corb used a system of vaults which did away with the need for much in the way of internal load-bearing walls, and throughout the apartment there are movable partitions which at a touch can close off or open up, to give different spatial sequences. There are also some great views: Le Corbusier’s bed is much higher than normal, and at first it looks quite odd, until you realise he raised it so that he and his wife could gaze out over the landscape of the Bois de Boulogne without having to get up. 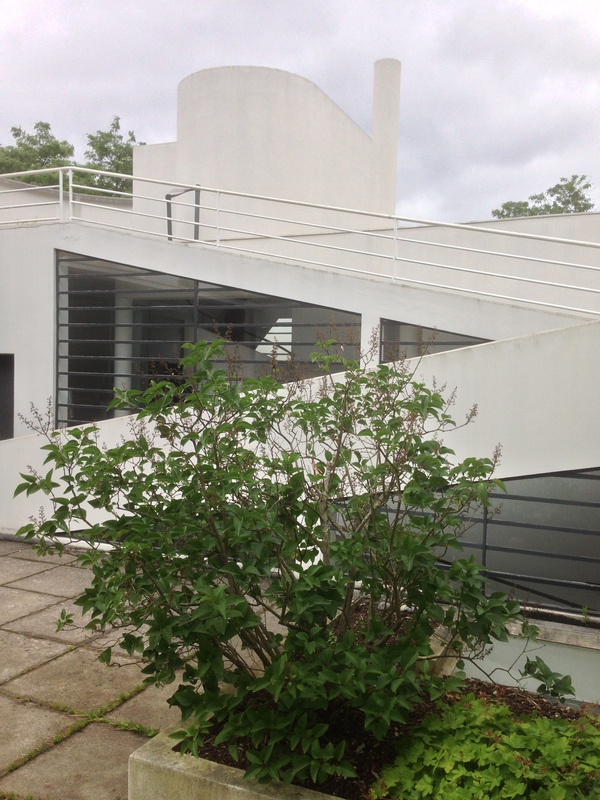 After 24 N.C., of course we had to go out to Poissy and see the Villa Savoye, the country home designed for Pierre Savoye and his family in 1928-31. 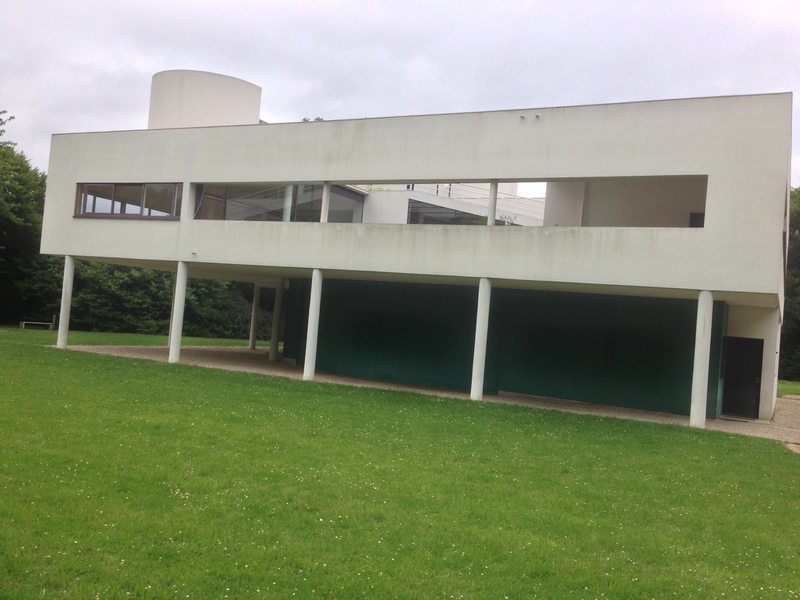 Unlike the other two machines for living in, the Villa Savoye is almost empty, so that although you don’t have the same feeling of a domestic space, you do have the opportunity to enjoy the architecture in the raw. Raised on pilotis, the house seems to float above the ground: Le Corbusier thought this healthier – ‘the soil is unhealthy, damp’ – and it also allowed the Savoyes to survey their estate and to feel part of a rural idyll. ‘The domestic life is inserted into a Virgilian dream,’ he wrote. 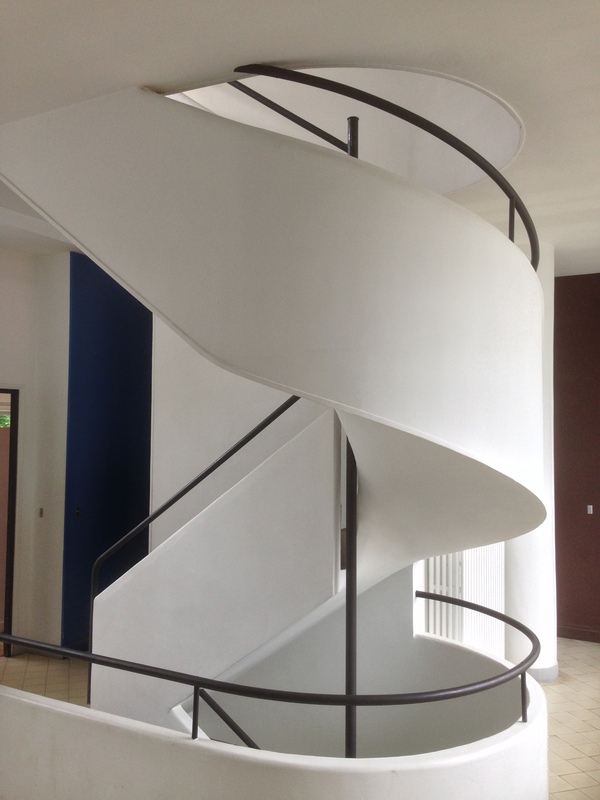 In early versions of the Villa Savoye, the architect included a straight external staircase up to the first floor, symbolically linking the living area to the ground. But in the finished villa, this disappeared, accentuating the floating quality of the building. Access to the upper floor and the garden terrace is by means of a shallow ramp which winds its way up through the centre of the house, and a spiral staircase which erupts on the roof in a bravura display, disrupting the harmonies of the box. 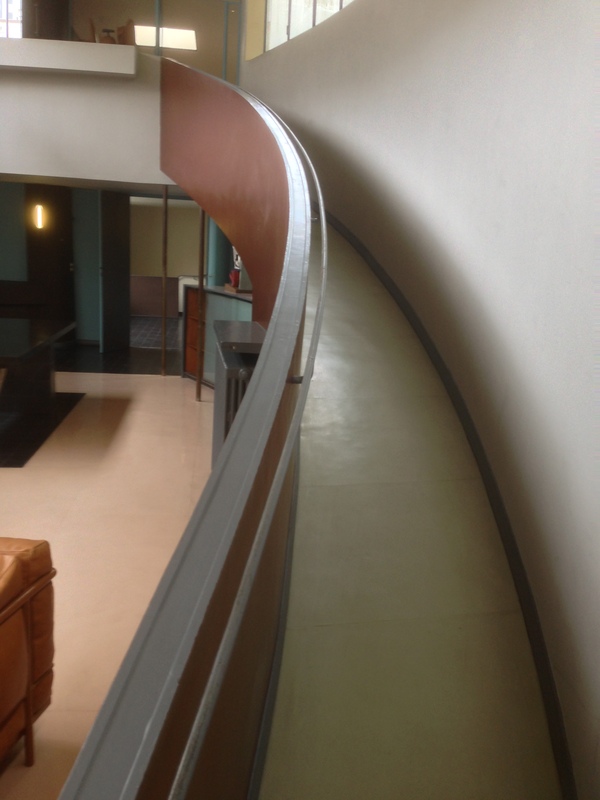 The Maison La Roche, 24 N.C, the Villa Savoye – they all touched my heart. They all made me happy.